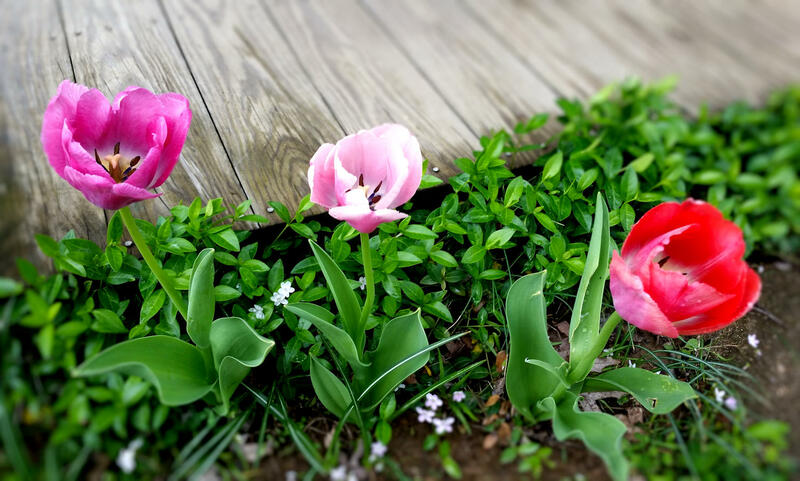 I haven’t always had luck with tulips. They’re like candy to the deer. I planted these last fall right next to my studio. 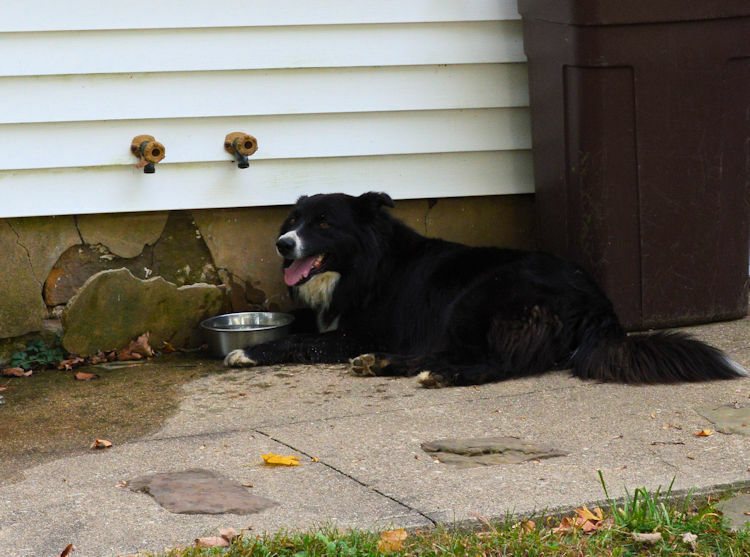 Mikey the dog will keep the critters at bay. Spring has finally arrived in this part of Southern Indiana. It’s so beautiful that it takes my breath away. Remember that crayon you used to have in your box called Spring Green? Well, it’s all over the place now. 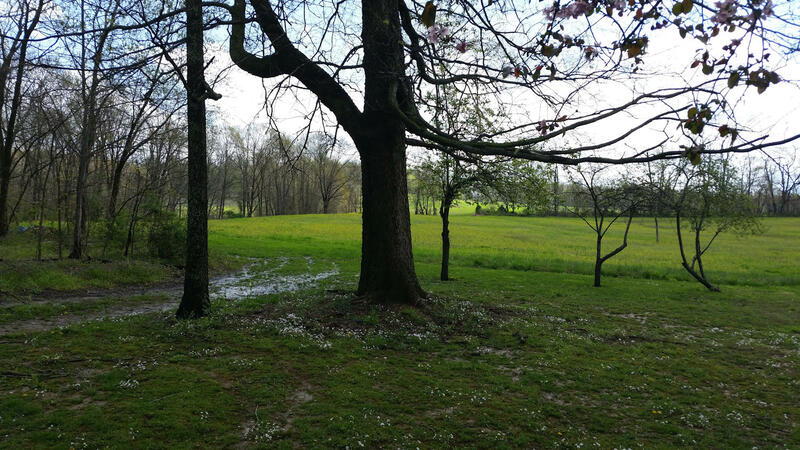 At this old homestead (over 130 years), there are many established flowers and trees. Plus we’ve added many more in the three decades that we’ve lived here. So I thought you’d just enjoy a walk in the country. Some of these flowers and trees are already on the wain while others have yet to bloom, the redbuds and dogwoods are just coming out now. Maybe another post about them later. An in and out day with the scudding clouds chasing the sunshine. I love the spring greens. 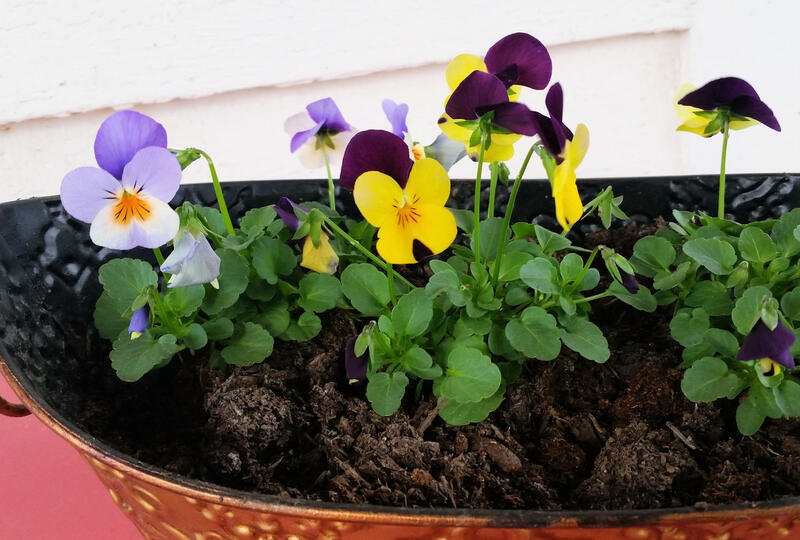 Little pansies are so cheerful. These came from an early foray to the local garden center about a week ago. I couldn’t help myself. A cheerful crab apple next to the garden. This is a start from the original which was a Mother’s Day present to me many years ago. 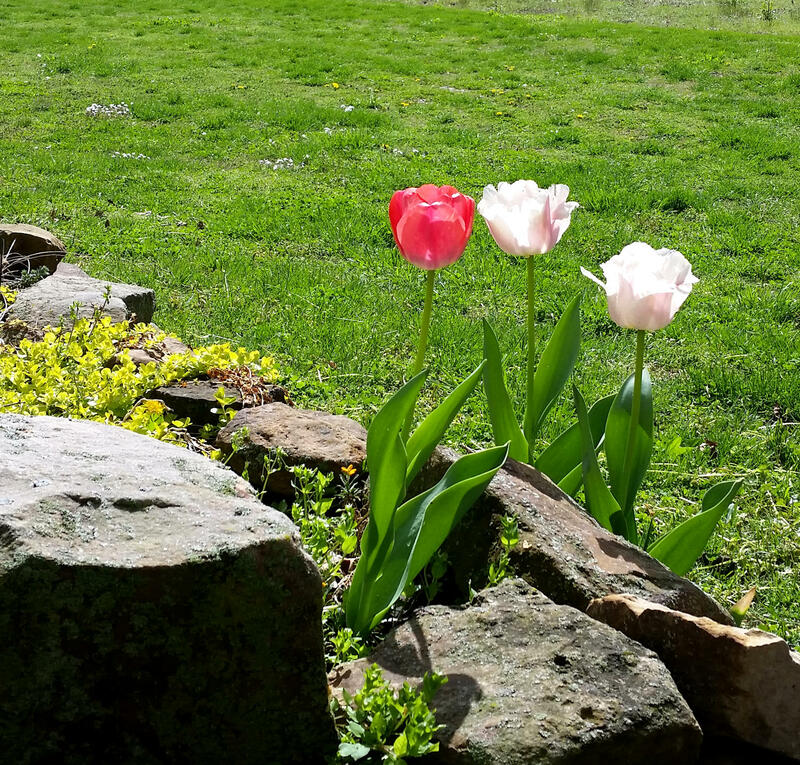 More tulips basking in the sunshine. 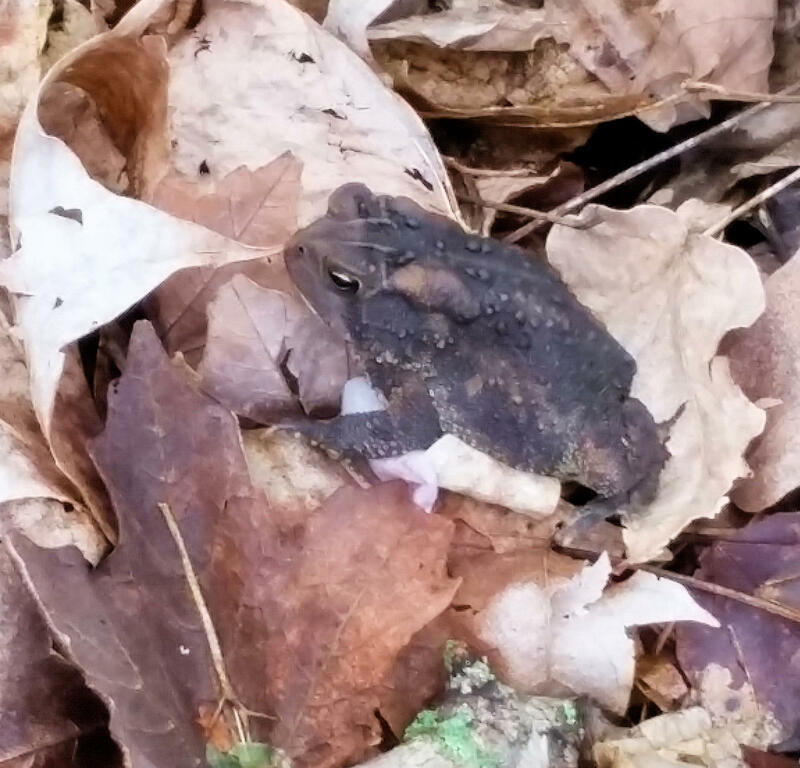 A friendly little toady emerging from the leftover leaves. He looks a little ragged. I expect he’d like a nice breakfast of some juicy bugs. The east fields, still soggy from the night’s rain. More clouds and sun shadows. 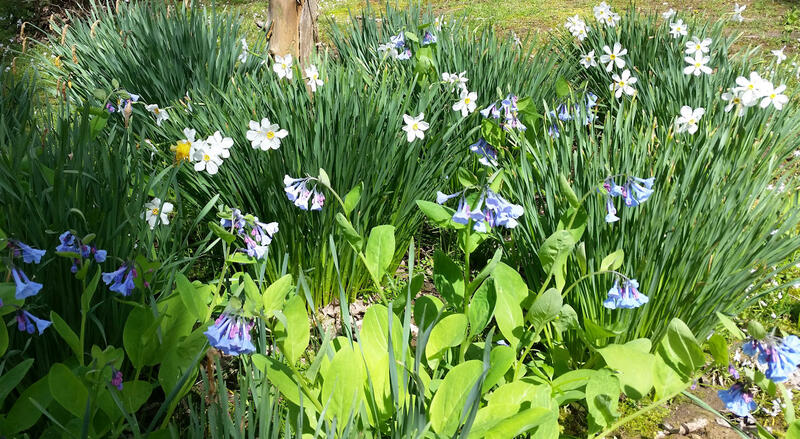 Bluebells and narcissus. These have become naturalized in several spots of the yard and I have more plans to move some starts elsewhere this spring. 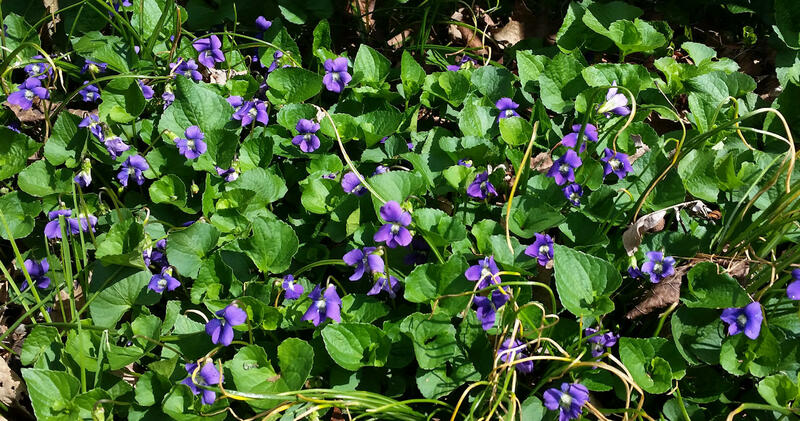 I love violets. They come in so many variations but these deep purple ones seem to be dominant. 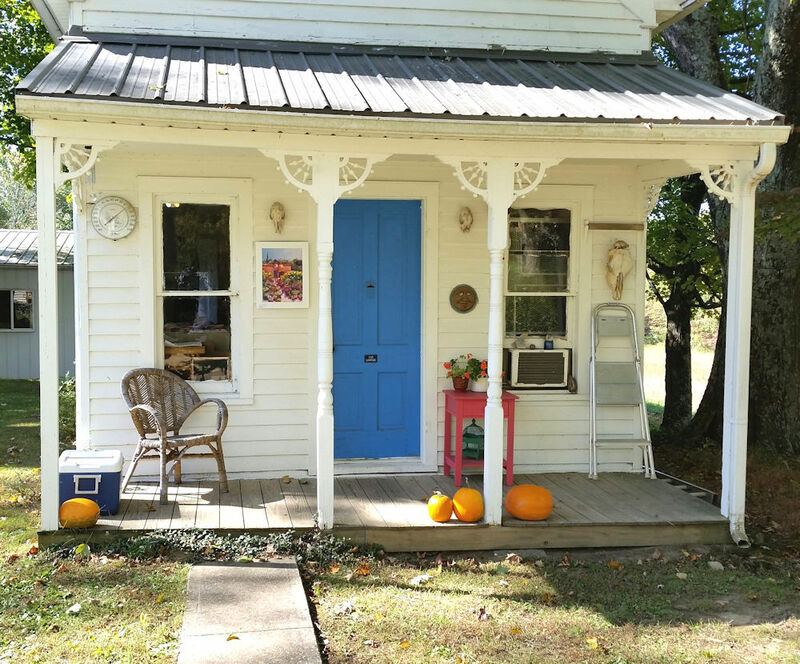 The front of my blue door studio. This is an old summer kitchen and my commute is only 30 feet from my back door. 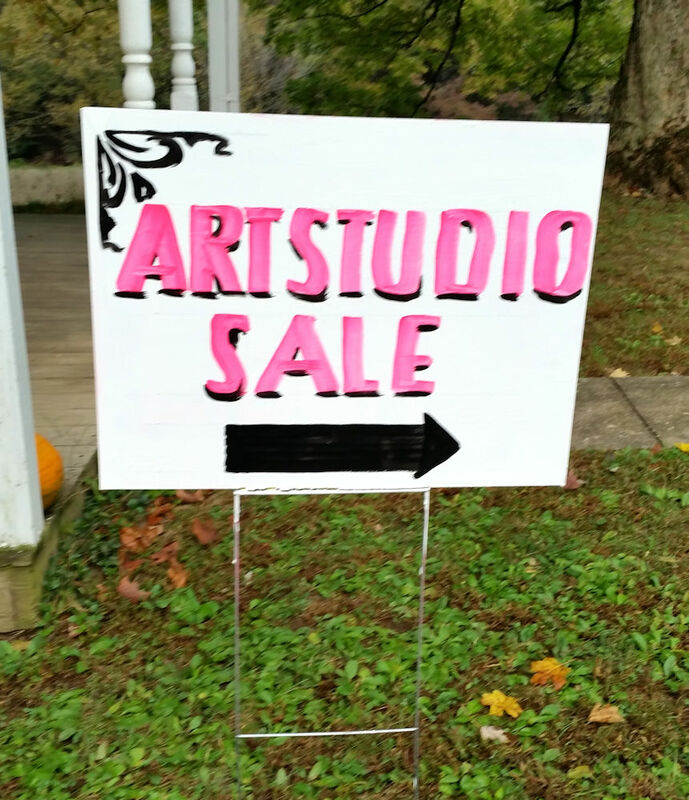 It was a beautiful weekend for my studio sale. The weather was sunny and temperatures were in the 60s. Fall colors are starting to appear on the trees. Saturday was a bit breezy but Sunday was perfect. I love to introduce people to my place of work and creativity. It’s just my escape, a place to play and contemplate. Initial set up in the front room during my studio sale. 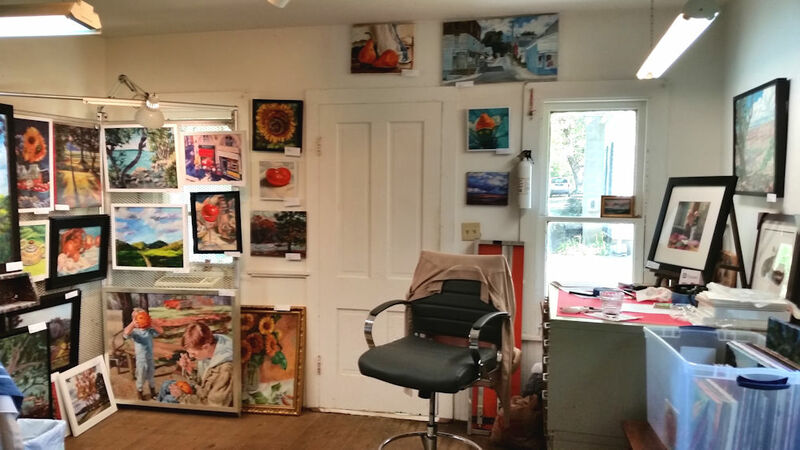 This lineup changed over the weekend as paintings were sold. Initial set up in the back room. 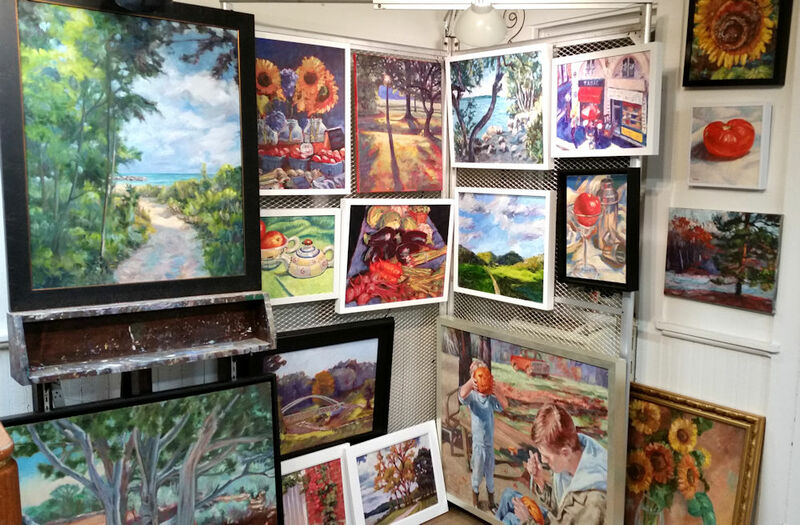 Although setting up for the sale is a major endeavor, it looked really great by the time I was done. Mostly from clearing out all the boxes which were moved to the greenhouse. The wider view. 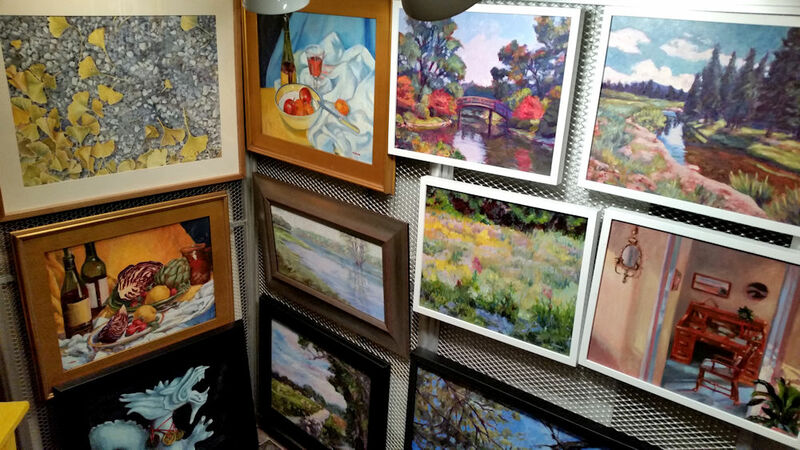 Paintings on nearly every surface, bins of unframed paintings, more and more and more. As I was pulling work from storage, bins and flat files, I came across many pieces that I’d totally forgotten about. Good food and drink are always attractions. Homemade minestrone soup, herbed bread, cookies and biscotti, and plenty of other goodies. No one went home hungry. And my many friends and supporters got some great deals, too. All in all, I think everyone had a good time. The fire pit. 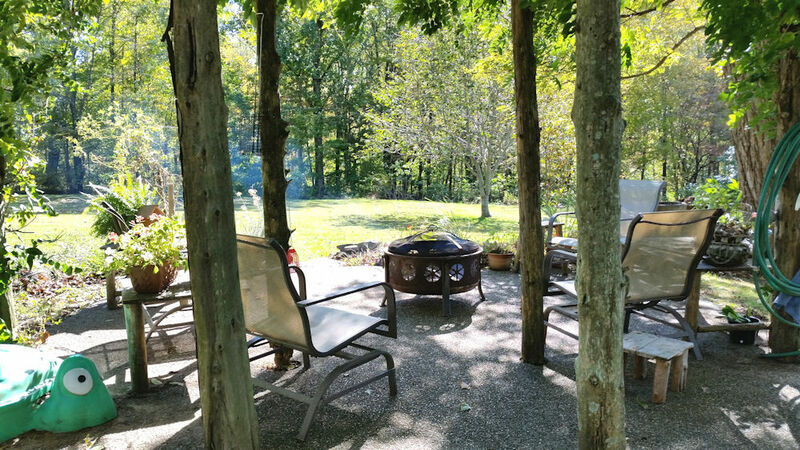 A perfect place to congregate on a beautiful fall day. I’m still even getting some inquiries from the photos I posted on social media. But, it will all be put away by the end of the week. Time to make more paintings! Until next year! Look for the pink signs, I kept touting on social media. 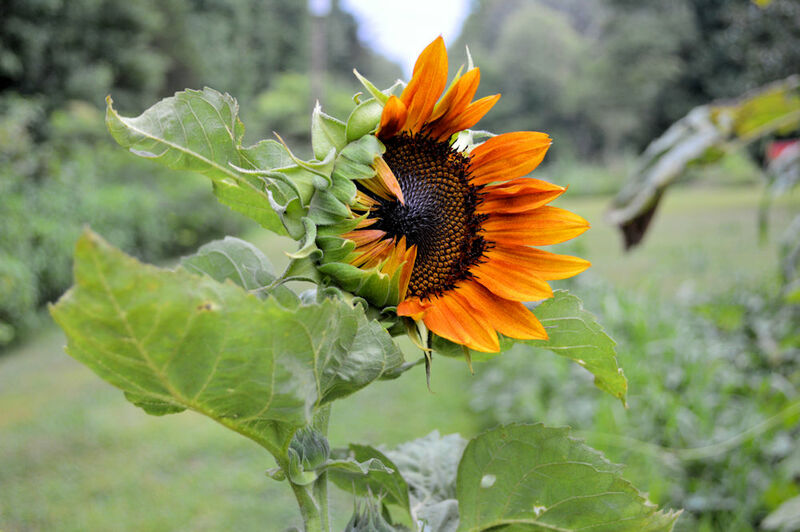 A pretty little sunflower playing peek-a-boo. I love the patterns of the seeds. Outdoor activities have been limited lately due to the extreme heat and humidity. Plus ozone alerts. Who would think that in a county which is heavily forested and has such low population that we don’t even have a traffic light, we would have trouble with air quality? It’s the Ohio River Valley influence again. Any work that must be done outdoors is usually in the early morning. However, some relief is in sight with cooler weather predicted for the next few weeks. Garden in July. Still looking pretty good. The corn in the far right of the photo has been harvested. We’ll take the used stalks to the neighbor for his cattle. Squash vines dying. Plenty of basil and cilantro which should be harvested soon. Now is when the real work begins. 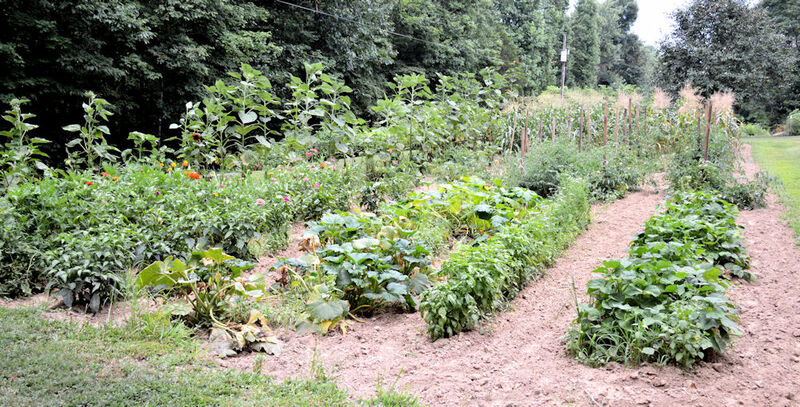 The garden is still looking pretty good but doesn’t seem to be producing as much as most years. We are usually overwhelmed with zucchini and summer squash this time of year but not this year. Also, green beans that we generally pick by the bucket seem sparse. The first crop of corn has been harvested and put up. Thanks to Mikey the guard dog for keeping the raccoons out of the corn patch. 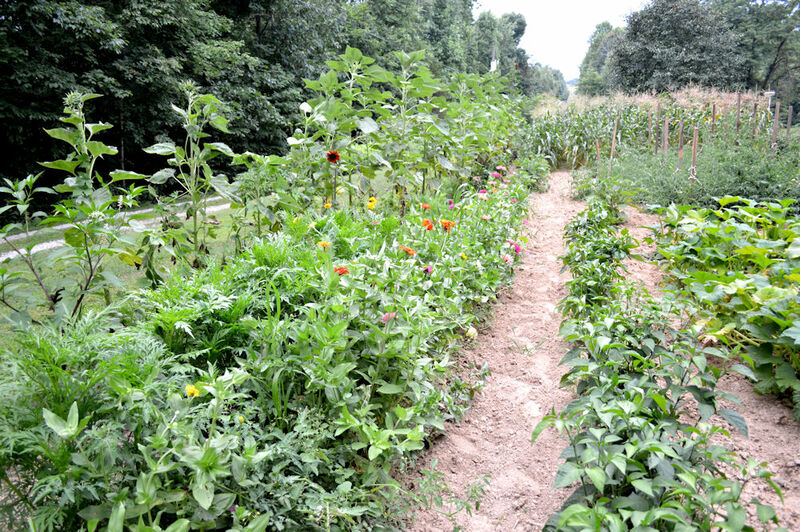 And it looks as if the tomatoes, peppers and eggplant will be plentiful. Just not yet. Garden in July. 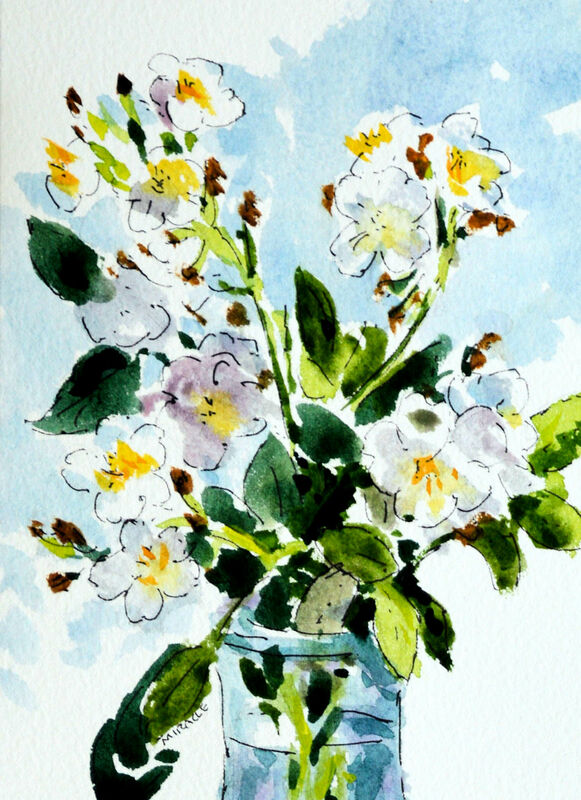 Flowers for cutting. Peppers coming on. Squash vines dying. One of my great pleasures is planting flowers for cutting in the garden. I love to bring in big bouquets for the house. The varieties change from year to year but I always have a row or two of sunflowers, especially the mammoth and the multi-stemmed varieties. Zinnias, cosmos, nasturtiums, are usually sown, but I add other varieties, such as baby’s breath. The many containers with flowers seem to be holding up well, probably due to better watering and care. This is one reason to plant in pots. The flower beds could use a good weeding and some more mulch but that will have to wait until the cooler weather next week. Living in the country makes one cognizant of the cycles of nature, whether it’s the heat of summer or the cold of winter. I think it’s easy to lose sight of man’s connection to his environment if you don’t experience some contact with nature every day. Just my humble opinion. I hope that you get some time outdoors this summer. 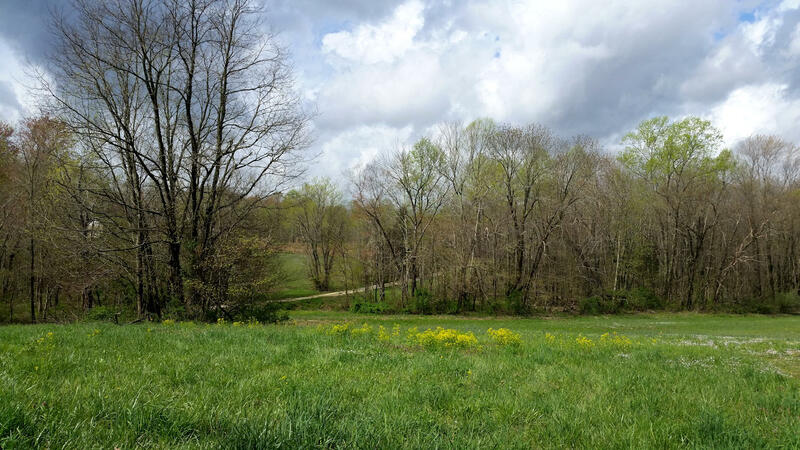 Spring in southern Indiana is a cacophony of overload for the senses. 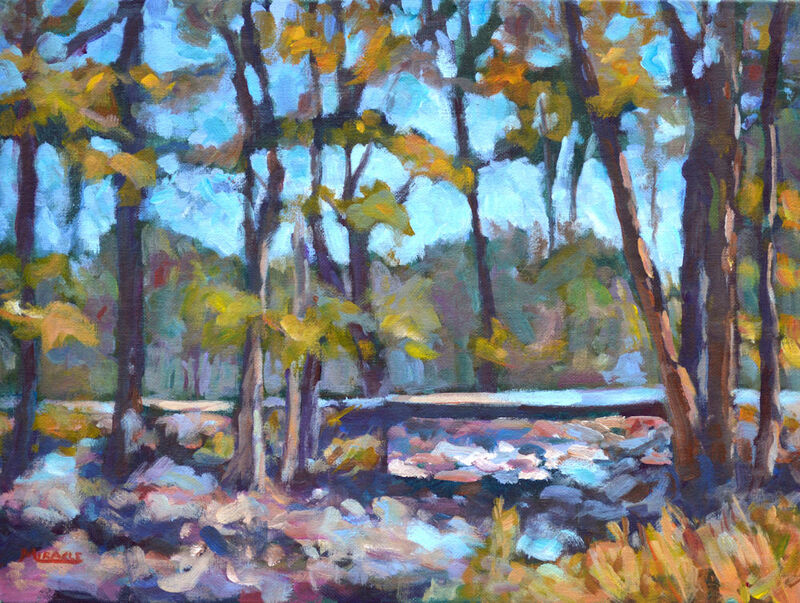 As an artist, I’m naturally attracted to the visual of the changing season. From the pale greens of new shoots and leaves to the endless variety of flowers. Something new is blooming every week. And sounds add to the wallpaper of the experience as I presented the cheerful house wren in a recent post. One thing that I haven’t touched on are the beautiful scents that waft through the air. Yes, there are plenty of floral perfumes from cultivated plants, but today I want to show you three wildflowers with really strong scents. The first is the multi flora rose. 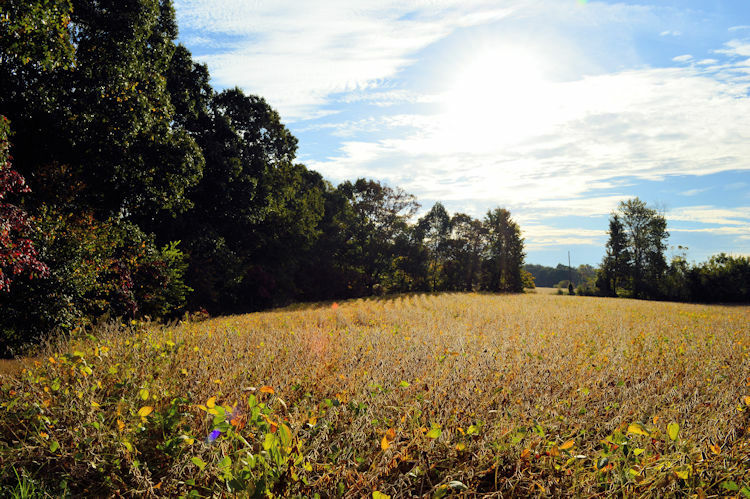 First introduced from Asia as a soil erosion remedy, it quickly got out of hand and is truly a noxious weed. So difficult to get rid of. However, for a few short weeks in spring, the scent of this flower is almost overpowering in the woods and ravines. It’s only redeeming quality in my opinion. Blooming right on the heels of the multi flora rose is the wild honeysuckle vine. I’m not sure if this species was introduced but is is definitely invasive. 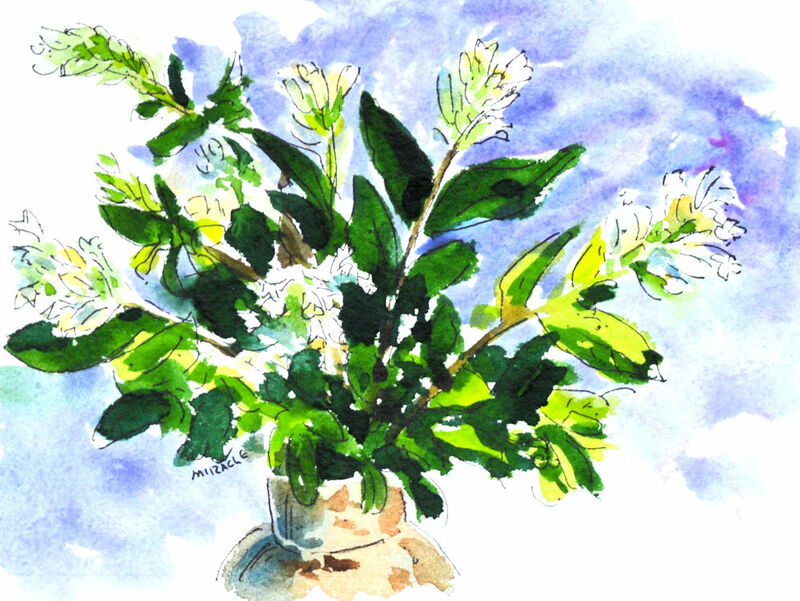 Around here we have the variety with white blossoms which fade to a creamy yellow as they die. Great food for hummingbirds, they unfortunately tend to strangle many trees and bushes. If you’ve ever seen a walking stick with a spiral design, it was naturally created by the honeysuckle vine. Its perfume is so strong as to be almost nauseating. Following on the heels of the honeysuckle vine is the common boxwood. This shrubby bush is semi-evergreen in this area. It is an under story plant and likes the shade of larger trees. 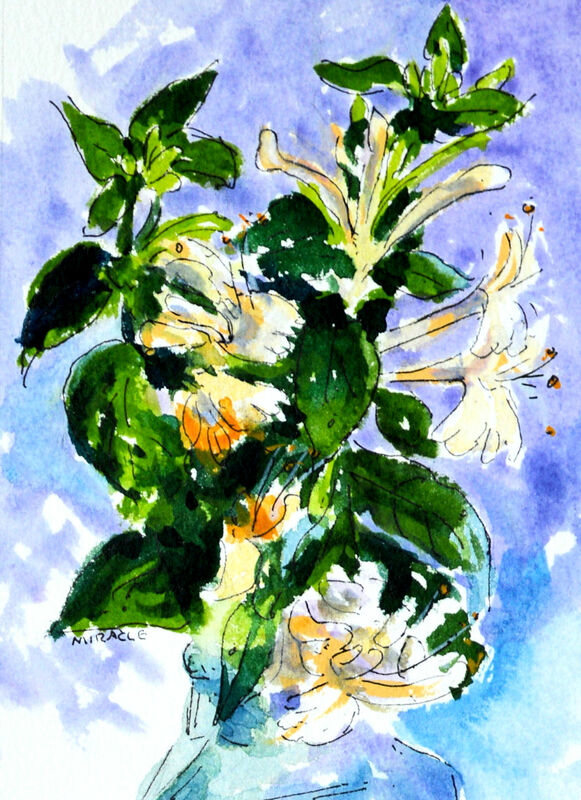 There are many varieties of this plant but around here it has smallish white flowers in little groups which look a lot like a small honeysuckle blossom. Again, the perfume is pleasant and not as overpowering as the first two plants. For people with allergies, the Ohio River Valley is probably not the most pleasant place to live, but the wildflowers certainly put on a show, both in blooms and scents. 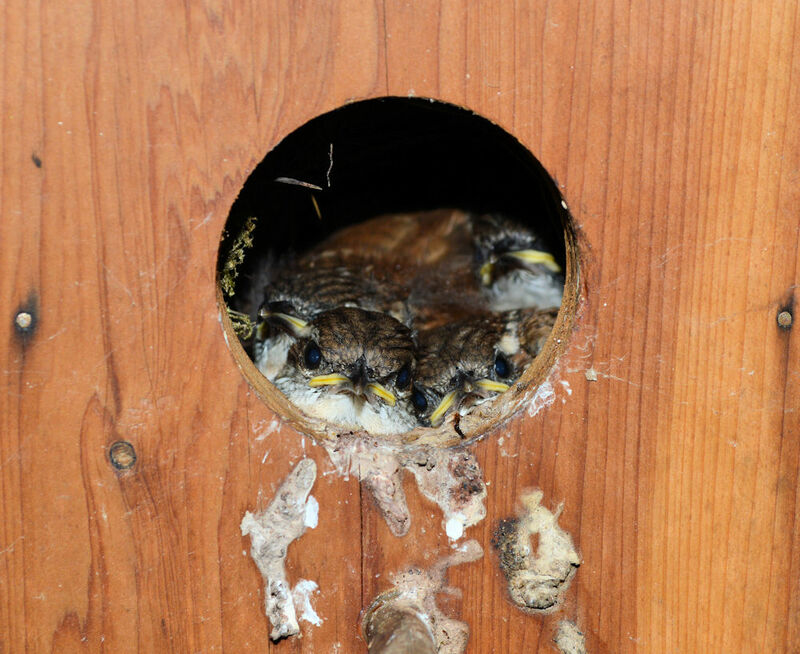 UPDATE: The babies fledged the day after I took this photo. I saw a wren already looking at one of my hanging flowerpots which is another favorite nesting site. Might get another family this summer. In this day of throwaway and disposables, sometimes I’m reminded of how precious the handmade and recycled objects of our lives can be. This old house is over 135 years old. The early homesteaders were very frugal and made the most of what they had. 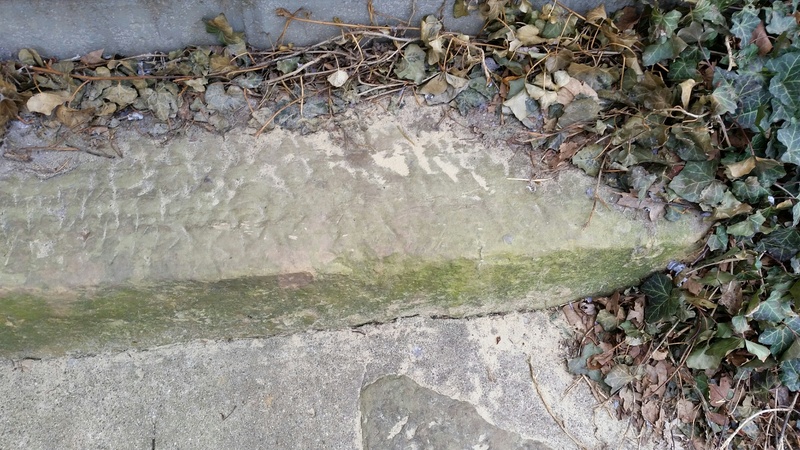 Old sandstone stoop. See the chisel marks for the stone. The stoop was flipped over when it got worn so the bottom side shows more wear. Here you can see the sandstone stoop for our back porch. Although sandstone hardens with exposure to the air, eventually it will wear down. In this area, worn out sandstone stoops are turned over to extend their lives. Old sheet repair. Notice how finely this repair is made. 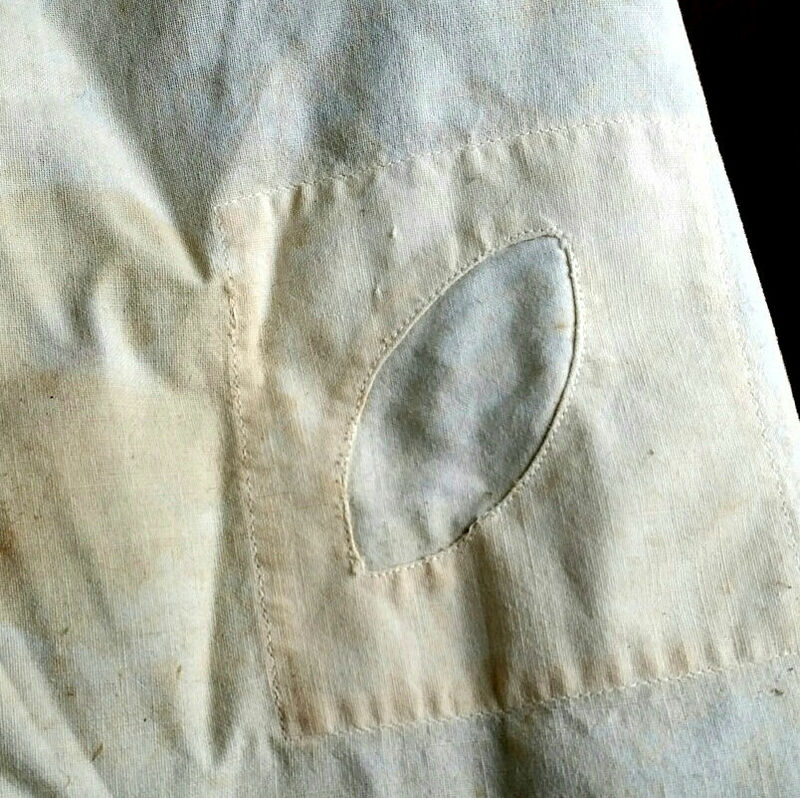 Here is a photo of an old sheet which received some very fine mending. Would anyone do that today? I doubt it. Repaired window with old glazing. 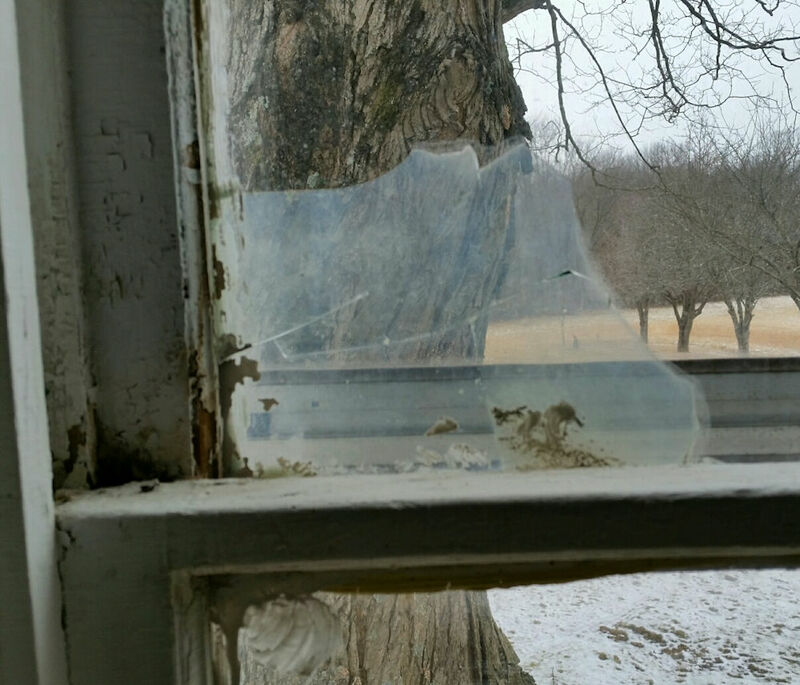 This is a photo of a broken / cracked window. Instead of having it replaced, a second sheet of glass, probably from another broken pane, was cemented to this one. Handmade door closure on attic door. 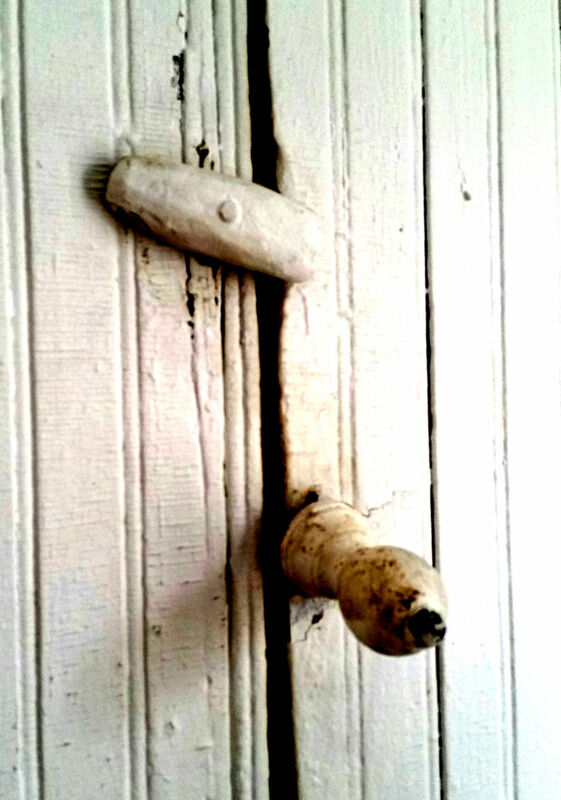 The door to the upstairs attic of my studio has a hand-carved wooden lock and uses some kind of turned wood for a knob. Sometimes living with the past makes one think more about the things we take for granted in our lives today. Next time you’re thinking of tossing something, give some consideration if it can be reused or recycled. Cedar trees are indigenous to southern Indiana and many parts of the Midwest. An evergreen, they add color to the winter landscape. 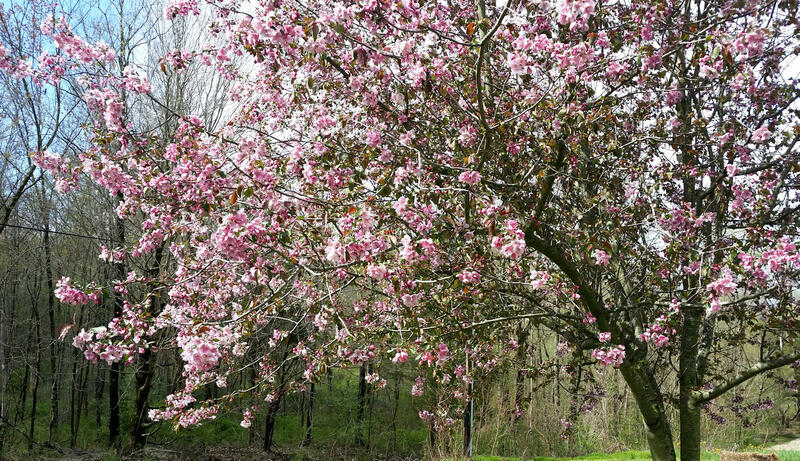 They often grow on soil where other trees can’t seem to get a foothold, limestone, sandstone, and rocky. 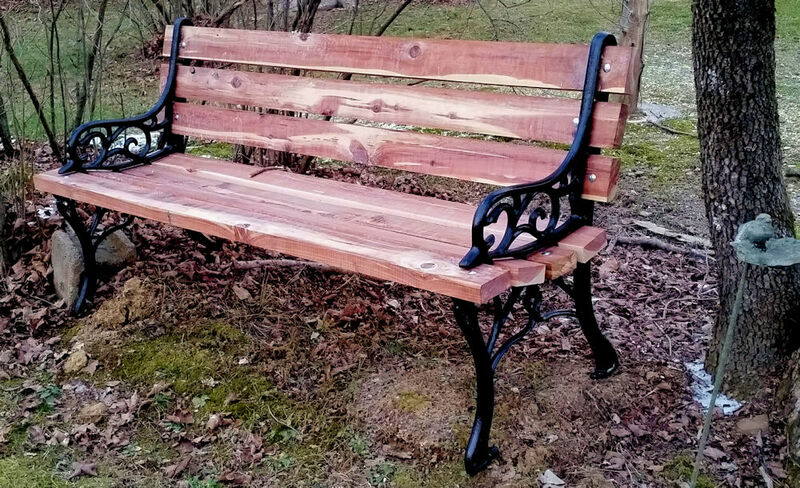 This year my family surprised me with refinishing two cedar benches in the garden. Although the benches were still serviceable, after 25 years, they needed an update. This locally cut cedar was selected due to its resistance to insect damage and other wear. I was told by the guys that even the old cedar boards were still in pretty good shape beneath the surface of lichen and weathered materials. The iron bench supports were repainted and new boards were planed and sanded for this lovely look. If you are not familiar with cedar, it has a wonderful smell which will fade in time as will the bright coloring to a silvery grey. I’m looking forward to spending some time on these benches this coming year (whenever a gardener has time to rest). They also are a reminder of my mother who owned the original benches so I guess they’re about 40 years old now. I remember many conversations we had on those benches over the years. 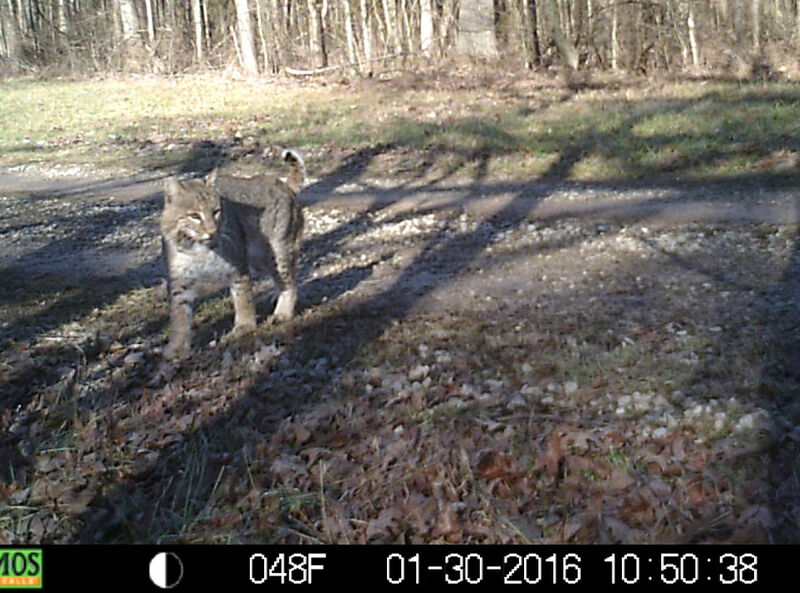 This is a large male bobcat. A really spectacular picture. Although the males are only about 30 pounds, I wouldn’t want to run into one. And my granddaughter and I had just walked down the drive earlier that morning! Yikes! 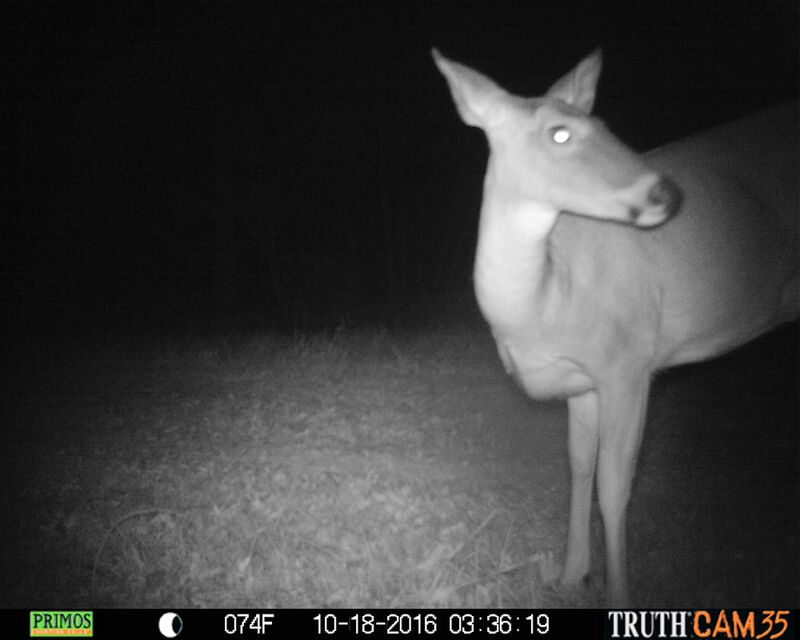 One of my favorite gadgets is our deer cam or trail cam. 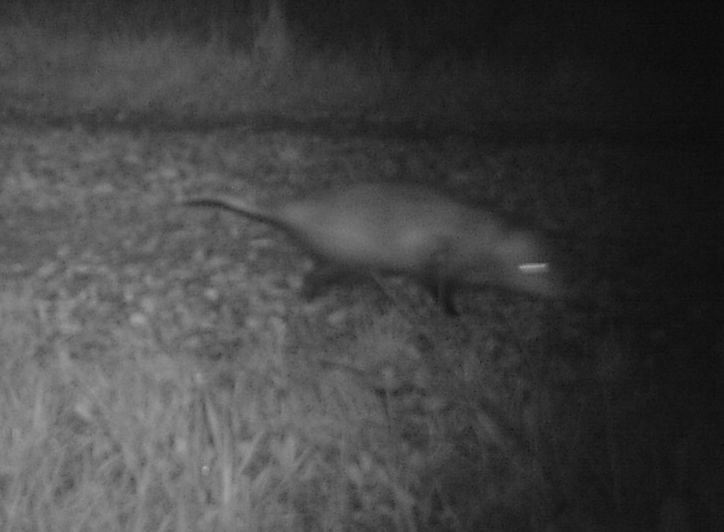 Over the years, I’ve had the pleasure…and surprise of catching many critters on camera. 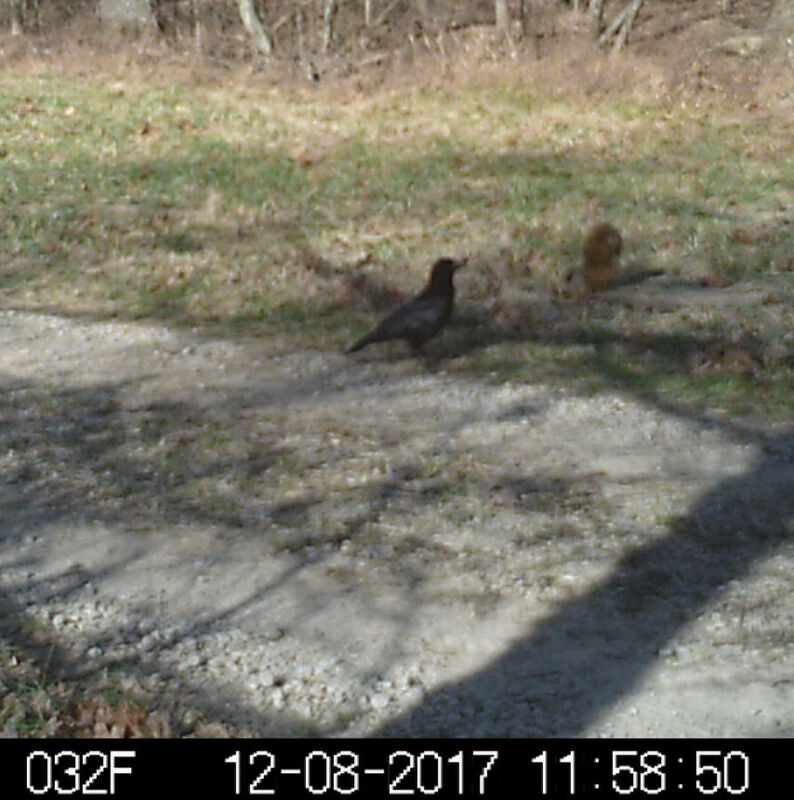 I’ve moved the camera around the property several times but it seems that the most active spot is a place on our driveway where it crosses a creek. 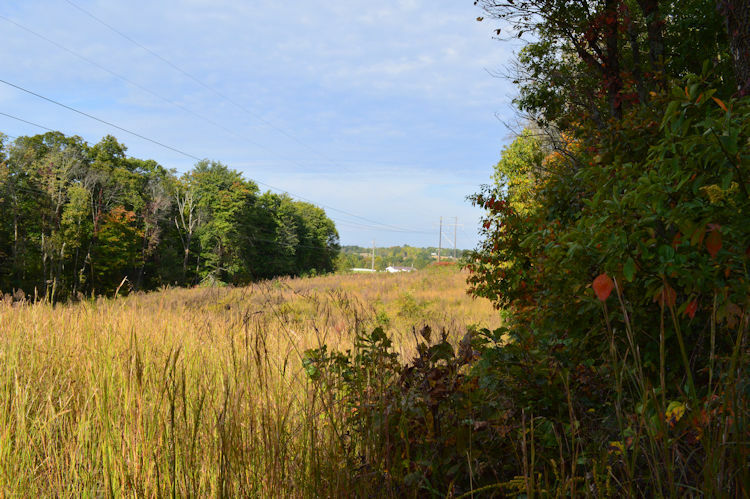 There are woods on either side with some fields nearby. Although much of the animal traffic seems to be at night, I’ve captured some pretty spectacular daytime shots, too. 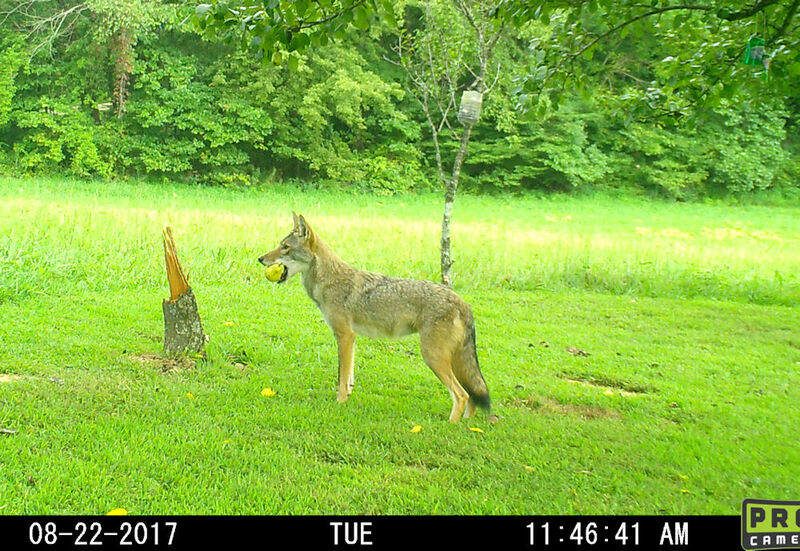 Coyote with pear. Taken in back orchard this summer. About 40 feet from the house. Check out the photos and enjoy a brief visit to my part of the world. I’m not including all the neighborhood cats, multiple pix of my dog (and some other dogs), the delivery people and other vehicles and tractors. 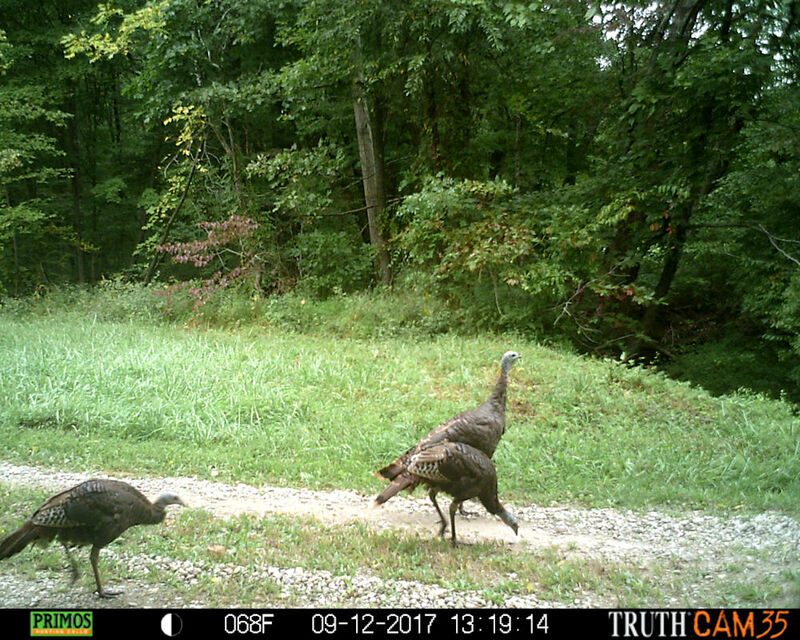 By the way, a trail cam makes a great present to the outdoor lover in your life. We have two cameras but I’d love to have more. 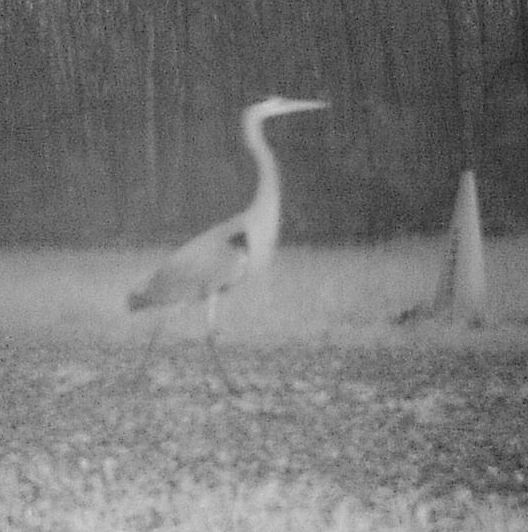 Heron strutting down the driveway. 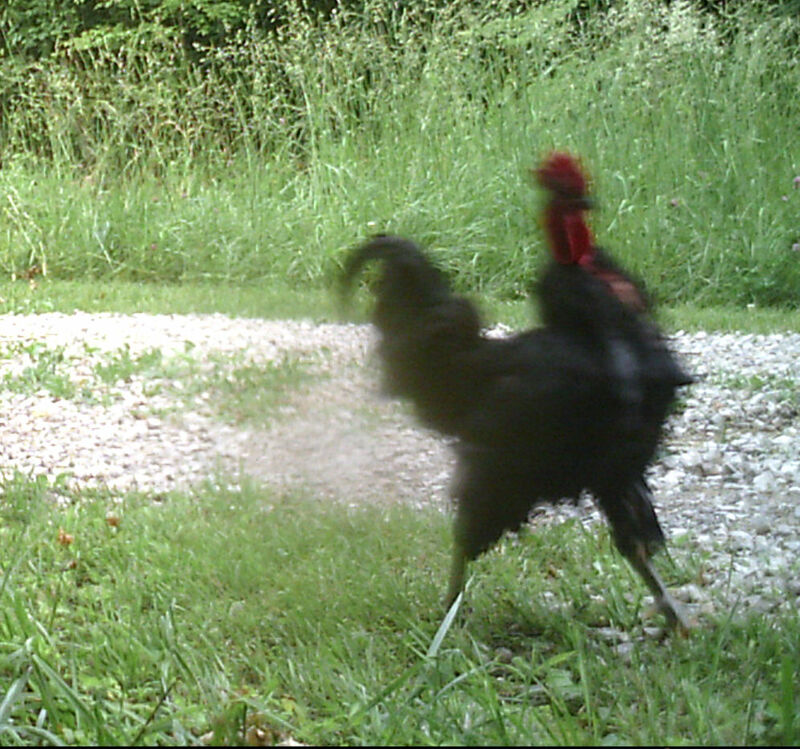 A very large rooster strutting down the drive. Probably an escapee from my neighbor’s chicken house. Mystery critter. I had moved the camera nearer the house and it was also near our security light. 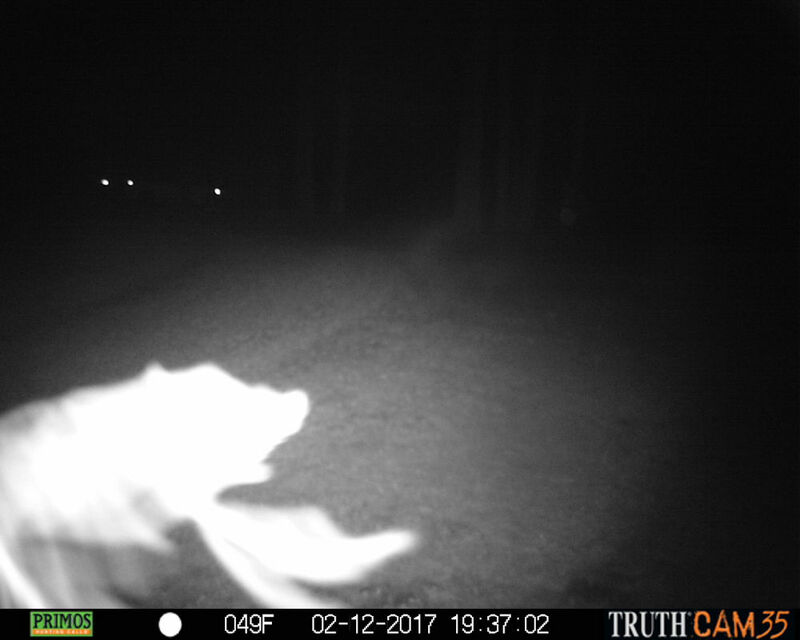 I kept seeing this creature pass in front of the lens. I finally concluded that it is a photo of a bat in action. What do you think? Is this my best side? 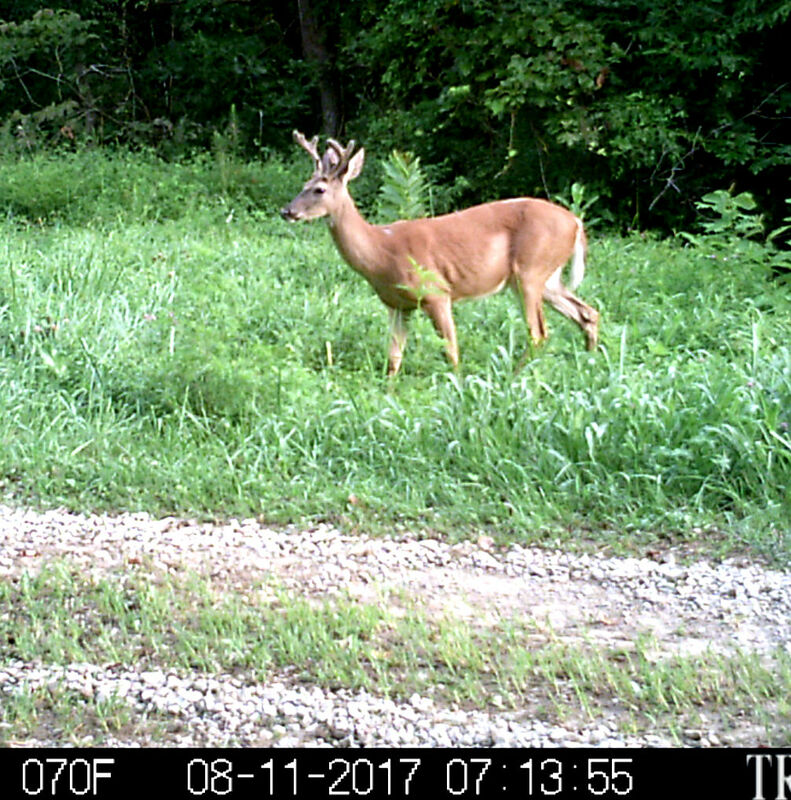 I get so many photos of deer (deer cam, right?). The light is infrared so they can’t see it, but I think they hear it click when it takes a picture. 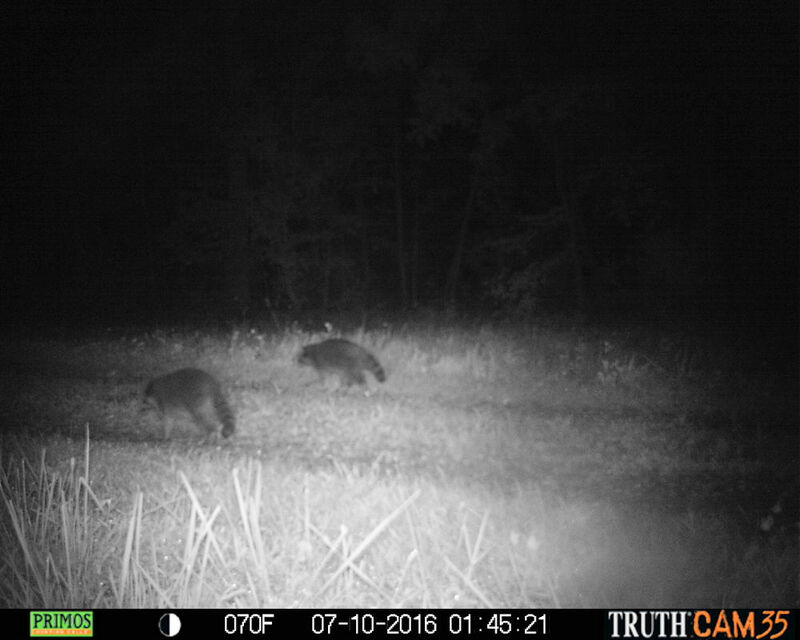 Two raccoons heading up the drive for a midnight snack. Probably the culprits for the losses in my neighbor’s chicken house. They are NOT cute. They are mean and vicious and can destroy a garden in a night. 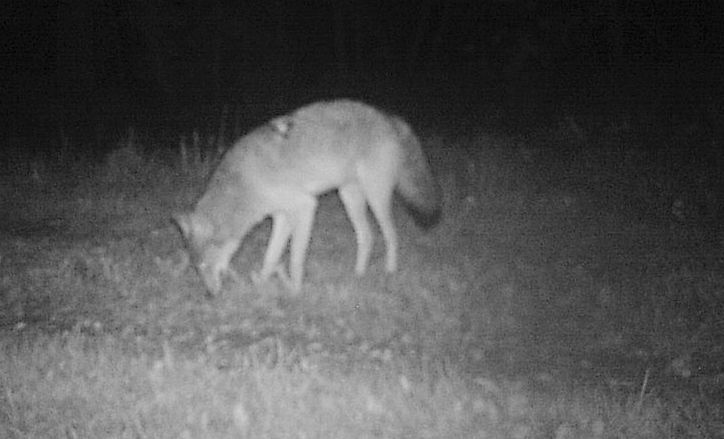 A large coyote with a bite mark. I’d hate to see what gave it to him. Coyotes often travel in packs. 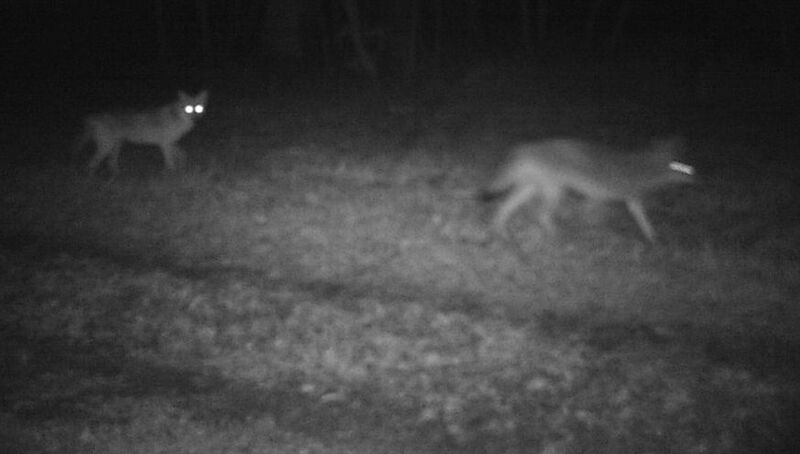 While usually shy, they were nightly visitors to our orchards this year. Wild turkeys are very crafty and great survivors in the woods. They actually can fly and manage to raise a brood every year. Many possums in the area. I don’t particularly like them but they are reported to eat thousands of ticks each day. That is good. They will also break into a chicken house and eat the eggs and baby chicks. Not good. 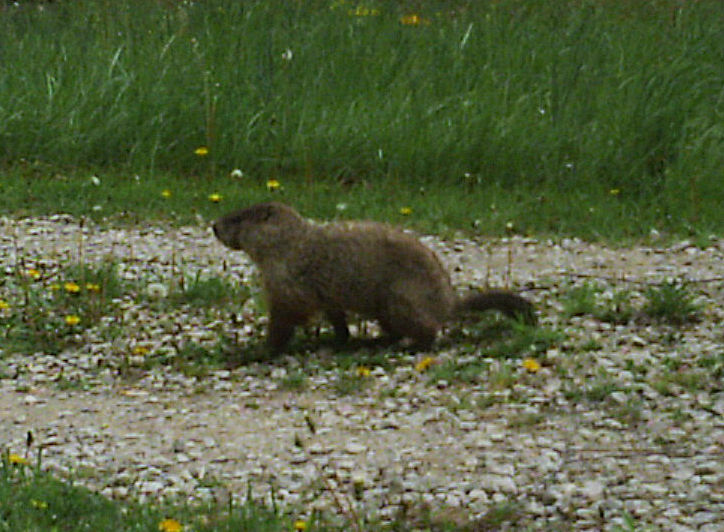 Groundhog. Not a desirable creature as they tend to dig out building foundations and otherwise become pests. A standoff between a crow and a squirrel. It appears that the crow is holding something in his beak. Night visitor. This is the scariest of all of the photos I’ve captured. The intruder is coming up the drive in the very early morning on Easter Sunday. (And, no, it’s not the Easter bunny!) With his knapsack and large knife, I hope that he was planning to do some mushroom hunting in the woods. But, also, the neighbor’s house was broken into that morning. Kinda creepy. Our dog was locked up unfortunately. A walk in the big woods. 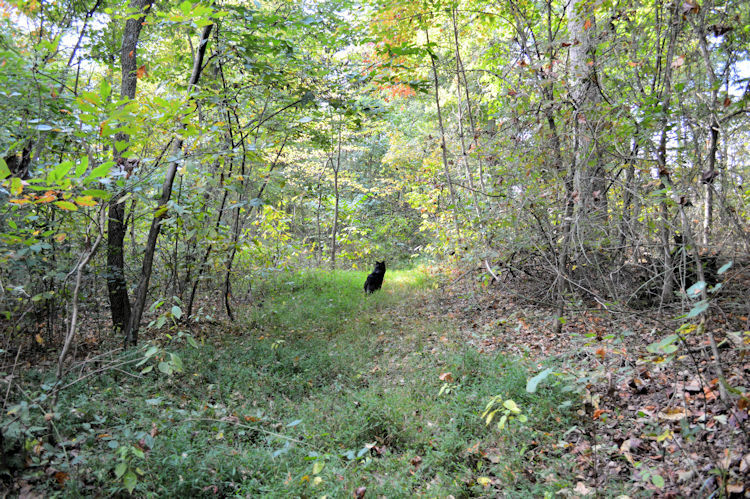 It was a beautiful early fall day on Friday so I decided that my dog Mikey and I needed to explore the big woods to see how things were progressing towards autumn. 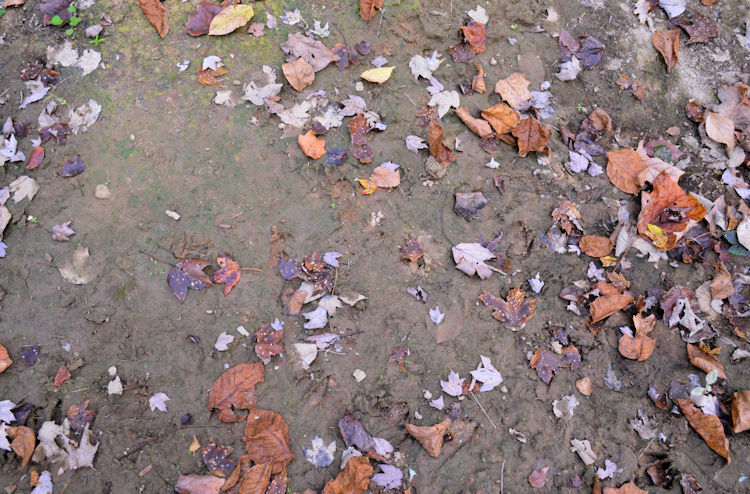 I always take a bag to collect fall things – acorns and pretty leaves, bits of lichen and moss. 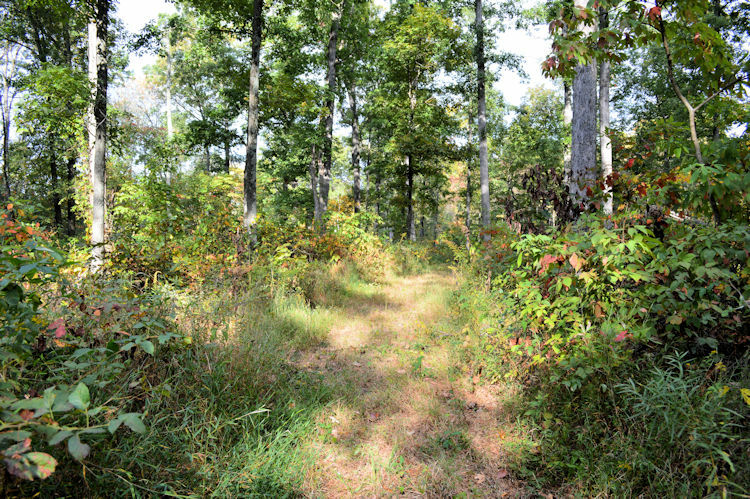 Our property is a mix of gently rolling hills and streams with some acres of hardwood (red and white oaks) up on a hill. It is one of the highest places around and one of my favorite escapes. Beginning of the walk through the east bean field. 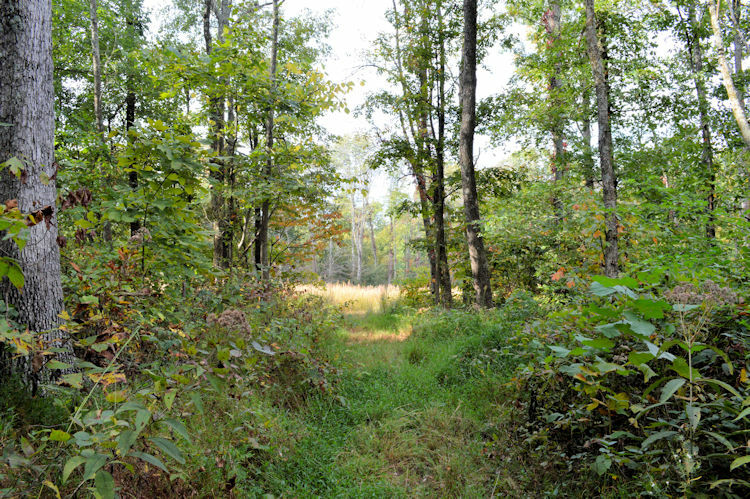 I usually don’t head up to the woods in the deep summer – too buggy and too many weeds. 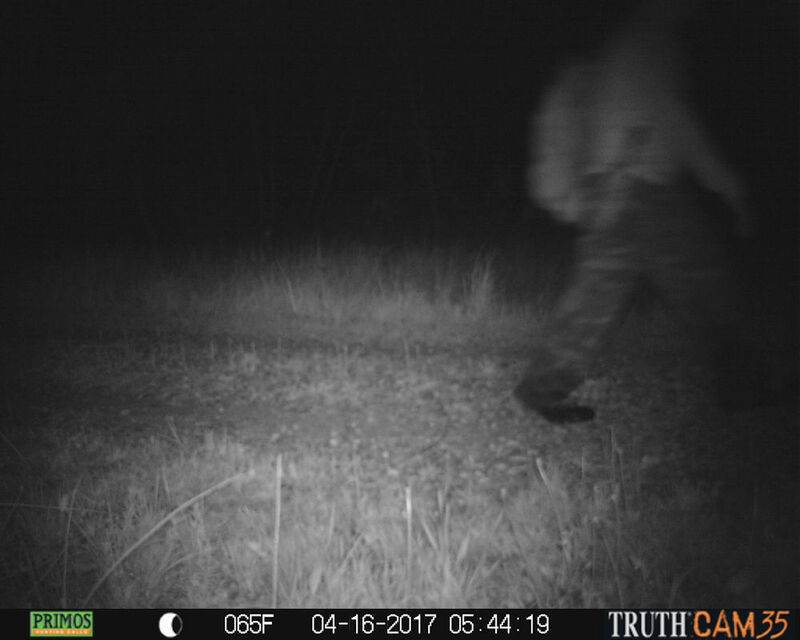 So I was eager to see what had happened since I’d last been up to the big woods last spring. Of course, this called for long pants and long sleeves, and some bug spray. Dang, I hate chiggers and ticks! And biting flies! 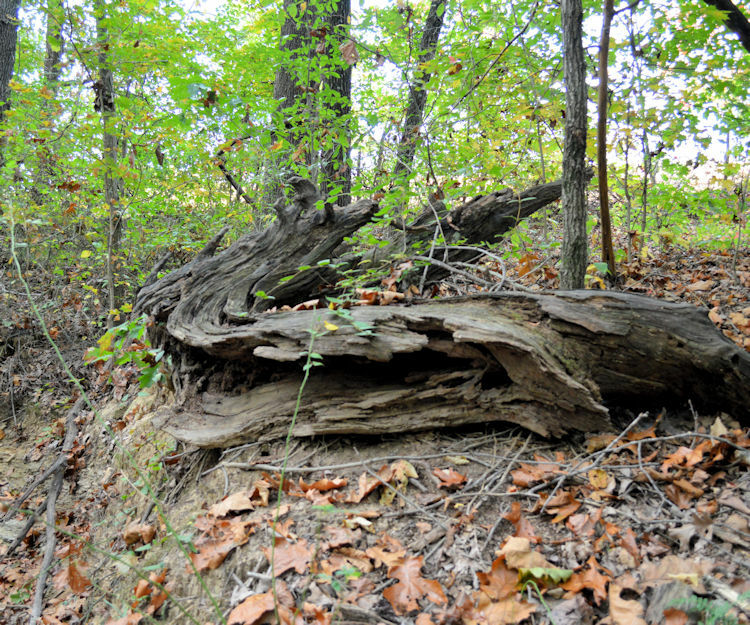 An old weathered tree stump on the dry creek bed. Through the hickory grove. Love the way the light strikes the dead cedar on the left. My companion Mikey waits almost around the bend. He’s very patient. Another almost dry creek bed. 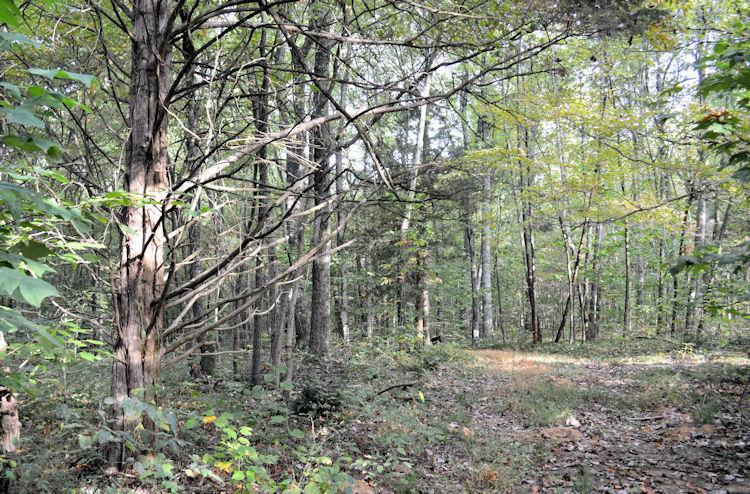 Look closely and you can see plenty of deer traffic through here, especially some very large prints. 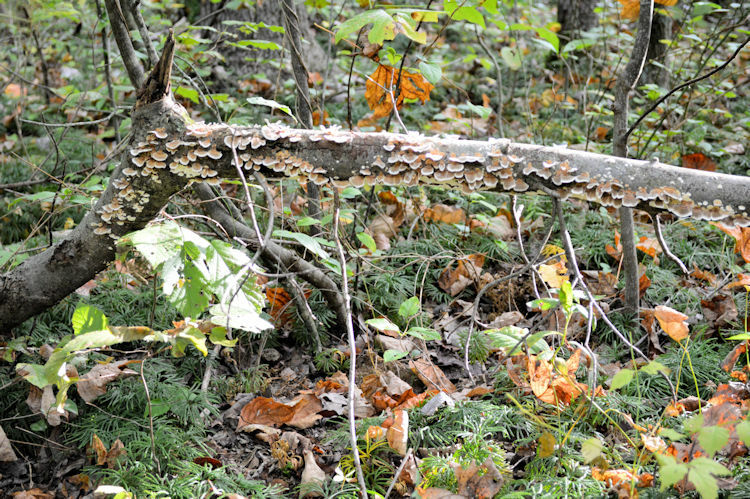 I’m always fascinated by interesting patterns of fungus and lichen. It’s a little early for many of the leaves to have changed color here but there were the beginning signs. And, as expected, the creeks were really dried up after the past few weeks without rain. Normally everything is very lush, even in the deepest of summer. Mikey loves to go into the woods and runs about 20 feet for my every step. Of course, one will never see any wildlife as he chases it all off. But I eagerly look for signs and wasn’t disappointed to see some pretty big deer prints in the mud near one of the creeks. Getting ready to cross under the powerline. Usually this is a cleared path but since we’ve added another path, this one has grown up over the summer. The weeds were taller than me! I’m heading towards that dead tree on the hill on the upper right. 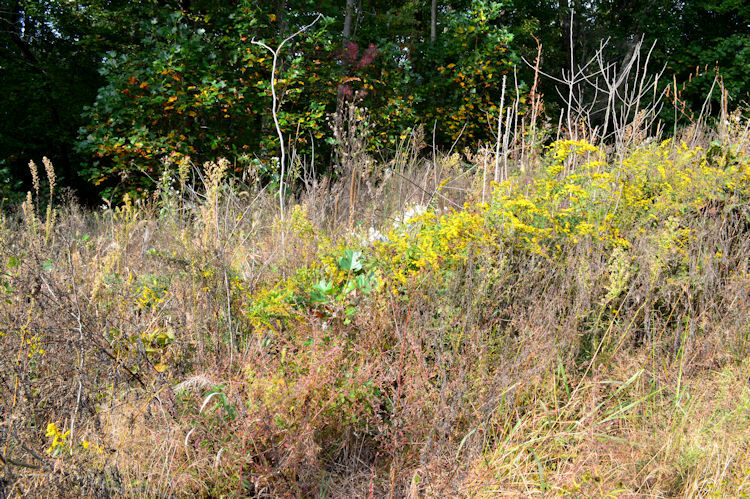 Wading through chest high weeds, I appreciated the brilliant colors of this late patch of goldenrod. I actually just walked through this (looking back). Path is totally grown over with some fierce briers, snatching at my hat and clothes. I can’t imagine the early pioneers and explorers wading through this kind of terrain, although deep woods really have little undergrowth. 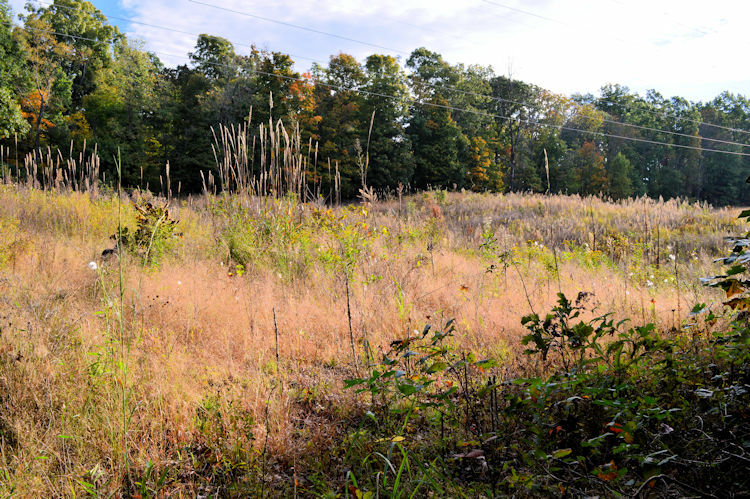 This is caused by the open spaces that were created when some trees were taken out. 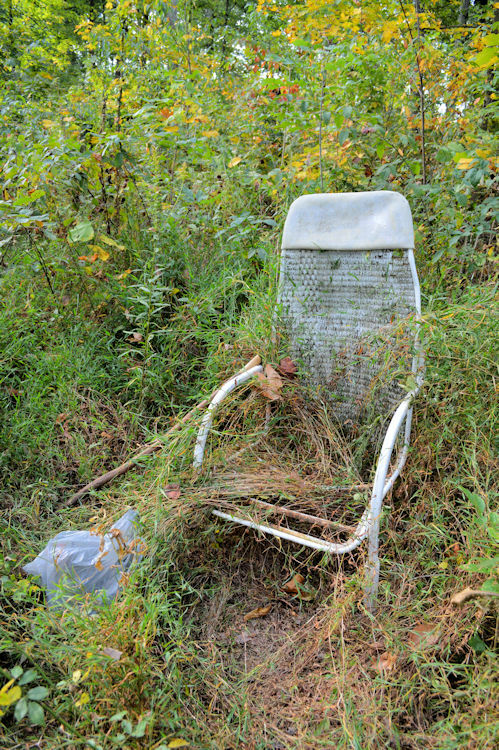 Reached my “resting” chair, an old chair that we dragged up into the woods on a favorite lookout space. I had to clear the weeds off just to sit down. Over the past 30 years, we have done some selective timbering. 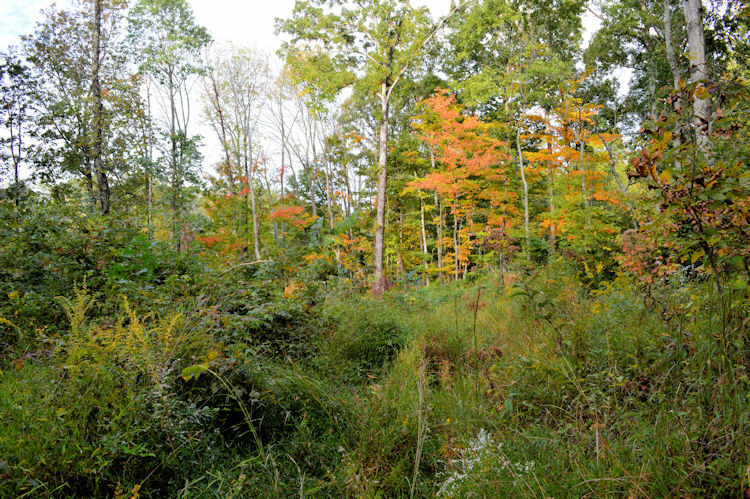 The last time was a few years ago and a new path was cut to the big woods on the hill. The old path had grown over but I wasn’t prepared for just how much it had grown over since last spring. I almost got myself into more work than I anticipated as I had to practically hack my way through the overgrown weeds and briers. It was a relief to come around to the new path (and mowed) area. I sure don’t know how the pioneers did it except that real heavy woods don’t have much undergrowth. We’ve hacked our way through the briers and have come out on the downside of the loop with the cleared new path. Yay! Now the hiking is much easier, exactly what I was anticipating. Coming out of the top woods, heading back under the powerlines. The view from the top of the woods on the hill. If you enlarge this photo, you’ll see farms in the distance which is about a mile or more away. 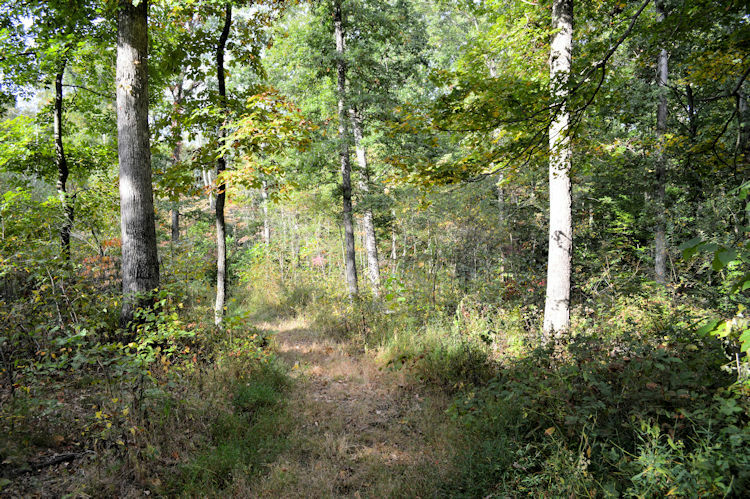 Easy walking through the lower woods. These are mostly hardwoods, red and white oak. Poor Mikey was as tired and thirsty as I was. I have never seen him lie down to drink. I think he really wanted to roll in the water on the cool sidewalk. Mikey and I had a good hike (about a mile and a half for me) and much more for him. But we were both exhausted by the time we returned to the house. An immediate shower was called for to help prevent any chiggers or ticks from digging in. So far so good. Lots of good material for future paintings and a pleasant way to spend a fall morning.